With its caramelized outside, this Easter ham will be hard to resist. Basting this ham with the glaze and its own juices keeps it tender and juicy. Treat your Easter guests to this scrumptious honey glazed ham for an Easter dinner they won't forget. Cooking a ham for Easter? 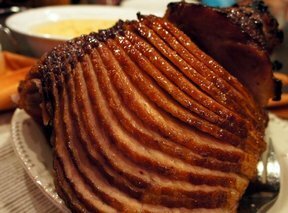 See our step-by-step instructions on how to roast several different types of hams for Easter dinner. Check out our instructions on how to carve several types of ham to be sure you get the most out of your ham.